All transactions are safe and secure with a reliable history in online purchasing behind each of our associates. Buy the Charlie's Horse t-shirt to own It's Always Sunny in Philadelphia clothing and merchandise. If you have seen the hysterical FX TV show It's Always Sunny in Philadelphia, then you probably recognize this black horse tee that has been worn in numerous episodes, including the famous Dayman episode. 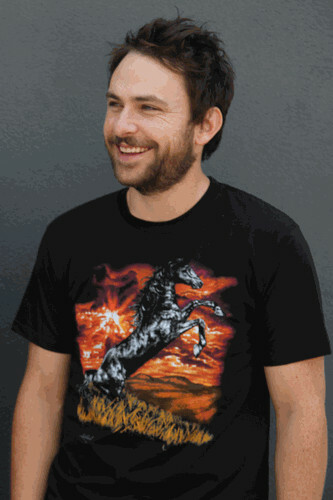 While Mac's shirts are great, this stallion tee has been a staple in Charlie Day's wardrobe since season one. While it is not accompanied by Charlie's stench, it's almost identical. Since impersonation is the sincerest form of flattery, grab this black stallion tee ASAP. Remember, you don't have to act like Charlie Day to look like him. In addition to the Charlie's Horse tee above, browse the It's Always Sunny in Philadelphia Clothing Gallery for more apparel like men's and women's clothes, kids shirts or hoodies.